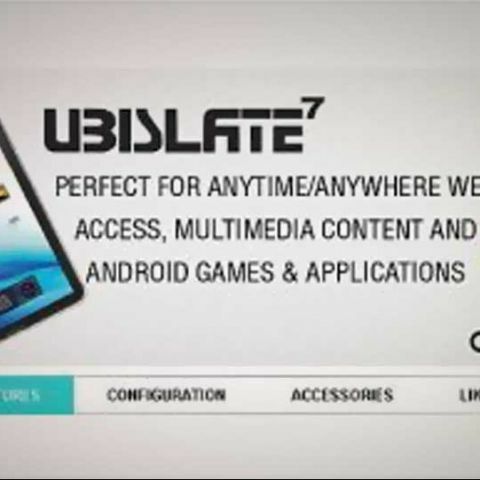 The manufacturers of the Aakash tablet, DataWind, have said that they are going to launch the device commercially under the brand name of UbiSlate next month. The price of the UbiSlate will be under Rs. 3,000 as reported earlier. According to CRN, the tablet will be commercially sold by the telecom channel partners and that an IT channel will be brought on later. CRN further quotes DataWind's CEO Suneet Singh Tuli as saying that the UbiSlate will come with a cellular modem for Web access. The company aims to sell nearly 300,000 units of the UbiSlate in the next financial year. DataWind has also set up a new production line in Hyderabad to manufacture the tablets. The UbiSlate is also a seven-inch tablet, running Android 2.2 Froyo operating system. It will have a resistive touch screen tablet with an HD video co-processor for a multimedia experience and core graphics accelerator. The device will include Wi-Fi connectivity and will support optional 3G modems. Moreover, there are two full-sized USB ports. The company plans to release five models of the UbiSlate. According to a DataWind official, the company is holding talks with a national distributor who will further co-ordinate with the telecom and IT channel partners. You can find more details about the UbiSlate here. Earlier, the government announced that it will initially roll out nearly 100,000 Aakash tablets at subsidised rate of Rs. 1,750 per unit. According to reports, the price of the Aakash tablet may be go down further. how to get the cryptographic kernal version of my mobile operating system ?